Don't trust flying fish. Especially Karal. So, I created a Klonoa Twitch Community, and I need your input on it! As the title said, I created a Klonoa Twitch Community without thinking too much, cause I didn't want any troll to take the name. You can all thanks @Manikku for reminding me that! So for those who dunno about Twitch Communities, here is the link to the Twitch blog about it. I want you guys' input on it so that I can improve it based on you guys' suggestions. 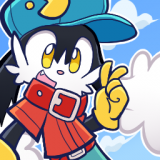 Oh and also don't forget to type in Klonoa in the "Community" field in your stream information on your Twitch Dashboard if you are gonna stream any Klonoa game or related content! Re: So, I created a Klonoa Twitch Community, and I need your input on it!